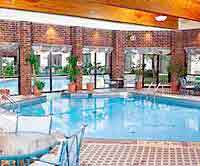 Located 12 Miles East of Cleveland Hopkins Airport and 8 Miles South of Downtown Cleveland. 191 Rooms from Standard Accommodations to Luxury Suites. In-Room Hairdryers, Iron/Boards, and Coffee Makers. Complimentary HBO and Cable Stations, Voice Mail and Wake-up Service. Complimentary USA Today.